Israeli doctors save Palestinian child from paralysis. Doctors: here, there are only patients. 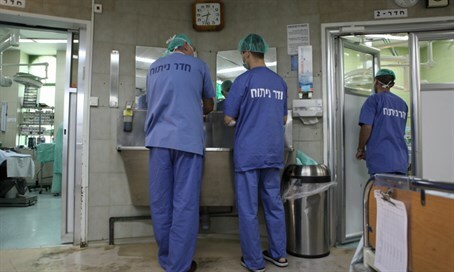 Israeli doctors performed life-saving surgery on a 3 year-old Palestinian Arab from Gaza last month, they revealed Tuesday, insisting to the press that politics has no effect on human life and obligation. Three year-old Saliman was suffering from a benign tumor on his spine - and was close to paralysis. "The pathology of the child was difficult," Josh Schroeder, senior surgeon at Jerusalem's Hadassah Ein-Kerem Medical Center, stated to Walla! News Tuesday. "He arrived with an advanced tumor, with considerable pressure on his spine." "He could not stand and look forward," he described. Schroeder added that the team - which had never seen a growth this big before - reconstructed the boy's spine to give him "a better quality of life." "We will follow up with him throughout his life, and intervene [again] if we have to," he said. Saliman was released last week, after three weeks of care in the hospital. The journey was also tough for the boy's family, who had "to leave their previous lives behind." "We give them all the support they need - there are medical staff and interns who come from the Palestinian Authority and speak the language and know the difficulties involved," Schroeder said, noting that the parents are happy with the results. "We hope they take it back to Gaza and talk about the good sides of Israeli society," he reflected. "There are no politics in the hospital - there are people, and we treat them on a daily basis." "Just yesterday we treated a girl from Ramallah," he continued. "Everyone is equal."